“I believe we should use all of a product that’s usable,” says Jenn Louis, chef and owner of Lincoln and Sunshine Tavern in Portland, Oregon (and an F&W Best New Chef). “I believe we should use all of a product that’s usable,” says Jenn Louis, chef and owner of Lincoln and Sunshine Tavern in Portland, Oregon (and an F&W Best New Chef). In spring and summer, this means that each time Louis and her staff wash a bunch of herbs, they reserve the stems and use them to make homemade herbal vodka. It’s a super-simple process and one you can easily do at home. Start by filling a glass jar about three-quarters of the way with vodka. In the restaurant kitchen, Louis uses a large cookie jar with a lid, but at home you can use a smaller glass container, such as a half-gallon mason jar. If you don't have a lid, cover the top with two layers of plastic wrap. And skip the expensive vodka, insists Louis. You’re infusing it, so you won’t taste any subtle flavors. Keep the vodka in the refrigerator, and then each time you use fresh herbs, add the stems to the jar. Make sure you wash the stems and stick to softer ones like mint, basil, sage, tarragon and dill. Louis also likes to use shiso stems and fennel fronds. Avoid woodier herbs like rosemary or thyme, but otherwise, use whatever you’ve got. There’s no exact recipe, explains Louis, so feel free to experiment with different herb combinations. You can also toss in large chunks of lemon zest to give the vodka some citrus notes—just be sure you’ve removed the bitter white pith. Infuse for at least a week. After that, just keep tasting the vodka until you like it. As you add more herbs and as the vodka sits, the flavor builds and becomes more concentrated. You can infuse for several weeks, but do a taste test periodically to make sure the vodka hasn’t turned bitter. Once you’re happy with the flavor, strain the vodka into a clean glass container and store it in the fridge, where it will keep almost indefinitely. 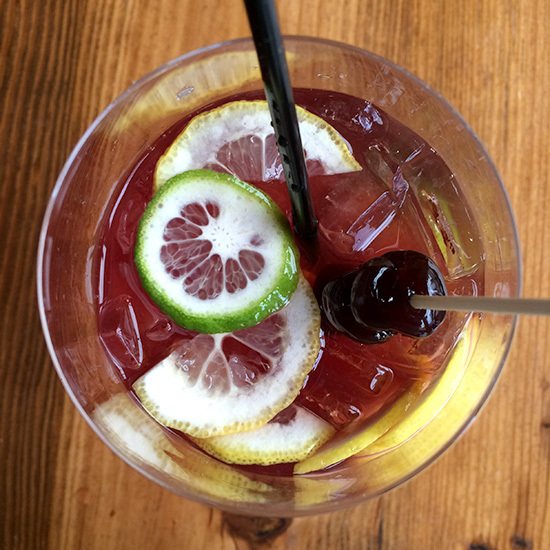 At Lincoln, Louis uses her herbal vodka to make the sangria included below. She also recommends combining two parts herbal vodka with one part vermouth and a couple dashes of orange bitters to create a summer garden-inspired herbal martini. Another option is to add some simple syrup and Prosecco to make an aperitif. Or, if you happened to include citrus zest in your infusion, add simple syrup to create an herbal take on limoncello, which Louis notes is really nice served chilled as a digestif. Stir all ingredients together and let sit overnight in fridge to marry flavors. Serve after 24 hours and strain fruit out of sangria after 2 days. Serve 5 ounces over ice in a Bordeaux glass, garnish with 2 skewered cherries and thin half-moons of lemon and lime.